Some time ago, Josh McDowell wrote the book Evidence that Demands a Verdict and later he wrote a followup book: More Evidence that Demands a Verdict. The book is packed with evidence that proves that the Bible is reliable. In John 5, Jesus makes an astounding claim. It was not an insurance claim, but a claim about himself. He claimed that God was his own Father. Jesus understood the implications of his claim for his next remarks show that he knew exactly what he was saying. The Jews understood the implications of his claim that God was his own Father for that was the reason why the Jews wanted to kill Jesus. And John, the author of this Gospel, understood what Jesus meant, because John is the one that tells us the importance of what Jesus was saying. This was why the Jews were seeking all the more to kill him, because not only was he breaking the Sabbath, but he was even calling God his own Father, making himself equal with God (John 5:18 ESV). John, the writer of this Gospel, wants us to understand what the Jewish authorities understood and what Jesus understood and what John himself understood: Jesus was making himself equal with God. “In the beginning was the Word, and the Word was with God, and the Word was God” (1:1). In several other places in this Gospel, John makes the same point: Jesus is God. “Who do you think you are, healing people on the Sabbath?” “My Father is always working, and so am I.” John tells us that Jesus was making himself equal with God. Later we considered the verses that follow John’s explanation. Jesus tells us that though he is equal with God, as Son of the Father, he is always submission to His Father’s will. Nonetheless, he has all the rights and privileges of God. He does the works of God: “Whatever the Father does, that the Son does likewise” (5:19). He raises the dead and gives them life: Just “as the Father raises the dead and gives them life, so also the Son gives life to whom he will” (5:21). Like the Father, Jesus has life in himself: “For as the Father has life in himself, so he has granted the Son also to have life in himself” (5:26). Jesus will execute judgment: “The Father judges no one, but has given all judgment to the Son” (5:22). The Son is to be honored just like the Father: “That all may honor the Son, just as they honor the Father. Whoever does not honor the Son does not honor the Father who sent him” (5:23). So the Son receives equal honor with the Father. Today, we want to look at the evidence. What is your evidence? Talk is cheap. Anyone can make claims. Anyone can claim to be God. Just visit the psychiatric ward of a major hospital and you will probably find people who believe that they are God. When we were living in French Polynesia, I had the opportunity to talk with a short little man with long hair who rode a blue bicycle. He claimed to be Jesus Christ. My Tahitian friends told me that the man had eaten the wrong kind of mushrooms. I did share the gospel with the man that day in hopes that the Holy Spirit would be able to penetrate the man’s deranged mind with the truth about Jesus Christ. Through the centuries, many people have made strange claims. Many have had dreams and visions and revelations and as a result, some have started new religions or cults or religious groups. What makes Jesus any different from them? What proves that Jesus wasn’t simply another lunatic? Jesus had proof. Jesus had witnesses. In fact, Jesus operates in the passage as his own defense attorney, calling witness after witness to support his claims. In a court of law, a witness is commonly sworn in. In my country, the witness is asked, “Do you promise to tell the truth, the whole truth, and nothing but the truth, so help you God?” The witness swears an oath before God that his testimony will be true. In the Old Testament, when capital crimes were committed — those crimes calling for the death penalty — before the death penalty could be given, there had to be at least two witnesses to the crime and their testimony had to agree completely. The idea of giving a true and accurate testimony was so important in the nation of Israel that God made it one of the Ten Commandments. The ninth commandment states, “You shall not bear false witness against your neighbor” (Exodus 20:16). If a witness were to bear false witness against another, he would receive the sentence and punishment he had intended for the other (Deuteronomy 19:18-19). If a man were to bear false witness against another to get him executed, he might be found out and be executed instead. “I can do nothing on my own. As I hear, I judge, and my judgment is just, because I seek not my own will but the will of him who sent me. 31 If I alone bear witness about myself, my testimony is not true (John 5:30-31 ESV). Jesus says that his judgment is just, but then he says, “If I were to testify on my own behalf, my testimony would not be valid” (John 5:31 NLT). What does he mean by that? Jesus makes a lot of statements about himself. He is not saying that every time he says something about himself that it is not true. He is referring to the need for additional witnesses. …The facts of the case must be established by the testimony of two or three witnesses (Deuteronomy 19:15 NLT). You may have had to go to a notary public to have your signature verified on an official document. Some documents require two signatures: there is a line your signature and another line for the signature of someone who witnesses you sign the document. Now suppose you were to sign on both lines. That would not work. You could not legally bear witness to your own action. You need someone else to confirm that you are the one who signed on the first line. That is what Jesus mean when he said, “If I were to testify on my own behalf, my testimony would not be valid” (John 5:31 NLT). There is another who bears witness about me, and I know that the testimony that he bears about me is true (John 5:32). 33 You sent to John, and he has borne witness to the truth. 34 Not that the testimony that I receive is from man, but I say these things so that you may be saved. 35 He was a burning and shining lamp, and you were willing to rejoice for a while in his light (John 5:32-35 ESV). The importance of John the Baptist can hardly be overestimated. Other founders of cults and religions have had followers, but none have had a forerunner announcing their arrival before they came. John the Baptist did not come after Jesus to confirm him as the Messiah. John the Baptist came before Jesus. John’s ministry was outstanding. Multitudes were going to him to be baptized. People began wondering if he was the promised Messiah or the prophet that Moses had promised. “I am not,” the Baptist told them. “Then why are you baptizing?” they asked. “I am preparing the way for the one who comes after me,” he responded. Though his ministry follows mine, I’m not even worthy to be his slave and untie the straps of his sandal” (John 1:27 NLT). The next day John saw Jesus coming toward him and said, “Look! The Lamb of God who takes away the sin of the world! 30 He is the one I was talking about when I said, ‘A man is coming after me who is far greater than I am, for he existed long before me.’ 31 I did not recognize him as the Messiah, but I have been baptizing with water so that he might be revealed to Israel.” 32 Then John testified, “I saw the Holy Spirit descending like a dove from heaven and resting upon him. 33 I didn’t know he was the one, but when God sent me to baptize with water, he told me, ‘The one on whom you see the Spirit descend and rest is the one who will baptize with the Holy Spirit.’ 34 I saw this happen to Jesus, so I testify that he is the Chosen One of God” (John 1:29-34 NLT). John testified about him when he shouted to the crowds, “This is the one I was talking about when I said, ‘Someone is coming after me who is far greater than I am, for he existed long before me. '” (John 1:15 NLT). John the Baptist points to the pre-existence of Christ. Though Jesus was born at least six months after John the Baptist, John says, “He existed long before me.” Christ did not begin to exist when he was conceived in the womb of Mary. According to the first verse of this Gospel, he is the Word who was in the beginning with God, and who was God (John 1:1). “Jesus, what proof do you have to back up your claims?” Jesus calls John the Baptist as his first witness. John testifies that Jesus is eternal. He is the Christ. He is the one who baptizes with the Holy Spirit. He is the Lamb of God who takes away the sin of the world. John the Baptist was an excellent, competent, and reliable witness. But the testimony that I have is greater than that of John. For the works that the Father has given me to accomplish, the very works that I am doing, bear witness about me that the Father has sent me (John 5:36 ESV). The Jewish authorities frequently asked for signs, miracles to prove that Jesus had the authority to do the things he was doing. For example, when Jesus cleansed the temple, the Jewish authorities understood that he was making a claim. He was claiming the right as Messiah to cleanse the temple. So they asked for a sign to show that he was indeed the Messiah. Instead, he challenged them to destroy the temple and he would raise it up in three days. The author, the apostle John, tells us that Jesus was actually speaking of the temple of his body. Jesus was predicting his own death and resurrection. The Jewish authorities would destroy him, but Jesus had the authority to raise himself up again. On the third day, he would rise from the dead. But there were plenty of signs for those who had eyes to see. The signs were miracles pointing beyond themselves. The signs signified something about Jesus. They pointed to his identity, who he was, and what he came to do. Jesus simply calls them his works. He says that his works prove that the Father had sent him. In John 2, Jesus changed about 600 liters of water into wine. His disciples saw his glory and believed on him. In John 4, Jesus simply spoke the word and the nobleman’s son was healed at a distance of some 30 kilometers. Again in chapter 10 Jesus will say, “The works that I do in my Father’s name bear witness about me,” (John 10:25 ESV). If I am not doing the works of my Father, then do not believe me; 38 but if I do them, even though you do not believe me, believe the works, that you may know and understand that the Father is in me and I am in the Father” (John 10:37-38 ESV). Jesus calls a third witness on his behalf, and that is the Father Himself. The works that Jesus did were an indirect witness of the Father to Jesus’ identity. But now Jesus says that there is a direct and personal witness that the Father gives. Perhaps Jesus is referring to the voice that many heard at his baptism: “This is my beloved Son, with whom I am well pleased” (Matthew 3:17 ESV). Or perhaps he is referring to the Father’s audible testimony when Jesus was transfigured before Peter, James, and John. In any case, Jesus said that the Jewish authorities were totally ignorant of the Father; they did not know Him. First, “his voice you have never heard,” Jesus said (John 5:37). Moses had heard God’s voice (Exodus 33:11). And Jesus speaks the words of God (John 3:34; 17:8), but the Jewish authorities did not hear God’s voice in Jesus. Second, “his form you have never seen” (John 5:37). Jacob had seen his form. “I have seen God face to face,” Jacob said. Jesus was himself the manifestation of God (John 1:18; 14:9), but the Jewish authorities failed to see God in Jesus. Third, Jesus told them, “you do not have his word abiding in you, for you do not believe the one whom he has sent” (John 5:38). Joshua meditated on the Word of God day and night (Joshua 1:8). The psalmist stored up God’s word in his heart (Psalm 119:11; 1:2). Jesus was himself the Word who was in the beginning with God and who was God, but the Jewish authorities did not delight in God’s word. They failed to recognize the Word when he was standing before them. You search the Scriptures because you think that in them you have eternal life; and it is they that bear witness about me, 40 yet you refuse to come to me that you may have life (John 5:39-40 ESV). This is a most stunning indictment. The Jewish authorities searched the Scriptures but failed to understand that the Scripture themselves bear witness to Jesus Christ. Jesus is speaking, of course, of the Jewish Scriptures, what we call today the Old Testament. …beginning with Moses and all the Prophets, he interpreted to them in all the Scriptures the things concerning himself (Luke 24:27 ESV). The Old Testament Scriptures pointed to Christ. The Christ would be more than just a man. He would be fully human, but he would be fully God: the God-man. So later in his ministry, Jesus asked the Pharisees how David in Psalm 110 could call the Christ “Lord” if the Christ were simply a descendent of David (Matthew 22:41-46). You don’t call your many times great-grandson “Lord,” unless he is… ah.. the Lord. The Christ would be much more than a human descendent of David. He would be that, but he would also be the Word made flesh, God in the flesh. Isaiah said that he would be born of a virgin and would be called Immanuel, which means “God with us” (Isaiah 7:14; Matthew 1:23). Again Isaiah said this virgin-born son would be called “Wonderful Counselor, Mighty God, Everlasting Father, Prince of Peace” (Isaiah 9:6). “Mighty God, Everlasting Father!” Yes, Jesus made himself equal with God, but that is exactly what the Scriptures had said he would be. The Scriptures gave witness to Jesus. For if you believed Moses, you would believe me; for he wrote of me. 47 But if you do not believe his writings, how will you believe my words?” (John 5:46-47 ESV). “The LORD your God will raise up for you a prophet like me from among you, from your brothers– it is to him you shall listen– (Deuteronomy 18:15 ESV). [God says] I will raise up for them a prophet like you from among their brothers. And I will put my words in his mouth, and he shall speak to them all that I command him. 19 And whoever will not listen to my words that he shall speak in my name, I myself will require it of him (Deuteronomy 18:18-19 ESV). And there has not arisen a prophet since in Israel like Moses, whom the LORD knew face to face, 11 none like him for all the signs and the wonders that the LORD sent him to do in the land of Egypt, to Pharaoh and to all his servants and to all his land, 12 and for all the mighty power and all the great deeds of terror that Moses did in the sight of all Israel (Deuteronomy 34:10-12 ESV). The people were still waiting. So when John the Baptist came on the scene, they asked him, “Are you the prophet?” “No,” he replied. When the people saw Jesus feed 5,000 men with five loaves of bread and two fish, they said, “This is surely the prophet who is to come into the world” (John 6:14). In John 7, Jesus promises flowing rivers of living water, that is to say the Holy Spirit, to those who come to him. When they heard these words, some of the people said, “This really is the Prophet” (John 7:40 ESV). Yes, Moses was another witness of Christ. Christ was the Prophet that Moses had spoken of. Jesus calls on four or five witnesses in chapter 5 to verify his claim to being equal with God. But there are two more witnesses in the Gospel of John. In John 15:26, Jesus says that the Holy Spirit, the Spirit of Truth, will bear witness about him. “But I will send you the Advocate– the Spirit of truth. He will come to you from the Father and will testify all about me (John 15:26 NLT). When the Spirit of truth comes, he will guide you into all truth. He will not speak on his own but will tell you what he has heard. He will tell you about the future. 14 He will bring me glory by telling you whatever he receives from me. 15 All that belongs to the Father is mine; this is why I said, ‘The Spirit will tell you whatever he receives from me.’ (John 16:13-15 NLT). So the Holy Spirit is a witness to Jesus. And you also will bear witness, because you have been with me from the beginning (John 15:27 ESV). But you will receive power when the Holy Spirit comes upon you. And you will be my witnesses, telling people about me everywhere– in Jerusalem, throughout Judea, in Samaria, and to the ends of the earth” (Acts 1:8 NLT). We are Jesus’ witnesses. 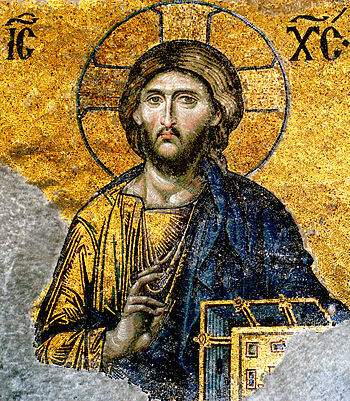 The message of the early Church was Jesus Christ. The disciples went everywhere preaching and teaching about Jesus (Acts 5:42). Peter preached Christ (Acts 10:36). Stephen was a witness to Jesus Christ (Acts 22:20). Philip went to Samaria and preached the good news about Jesus Christ (Acts 8:12). The disciples that were scattered because of the persecution went everywhere preaching the Lord Jesus (Acts 11:20). Paul preached Jesus and the resurrection (Acts 17:18). For I decided to know nothing among you except Jesus Christ and him crucified (1 Corinthians 2:2 ESV). For what we proclaim is not ourselves, but Jesus Christ as Lord, with ourselves as your servants for Jesus’ sake (2 Corinthians 4:5 ESV). Yes, the focus of the church has always been on Jesus Christ, who he is – God in the flesh – and what he did for us on the cross. We are Jesus’ witnesses. He claimed equality with God. He had the rights and privileges of God, and he called seven witnesses to authenticate his claims. John the Baptist bore witness to Christ that he was the Son of God. The works — miracles — that Jesus did showed that God authenticated his identity. The Father himself in a personal and direct manner bore witness to His Son at his baptism, at his transfiguration, and again in John 12 when his voice thundered from heaven. The Scriptures all pointed to Christ and identified him as the Mighty God, the Everlasting Father, Immanuel: God with us. Moses bore witness to Christ as the Prophet whose words we must obey. … Christ in you, the hope of glory. 28 Him we proclaim, warning everyone and teaching everyone with all wisdom, that we may present everyone mature in Christ (Colossians 1:27-28 ESV). So you have heard the evidence. What is your verdict? Is Jesus who he says he is? Is he equal with God? He does what God does. The witnesses say that he is equal with God. What do you say? As many as received him, to them he gave the power to become the children of God. He is the only way to the Father. Andreas Köstenberger, A Theology of John’s Gospel and Letters, 135. New English Translation (NET) note on John 5:18. R. C. Sproul. John (St. Andrew’s Expositional Commentary) (Kindle Location 1262). Kindle Edition. R. C. Sproul. John (St. Andrew’s Expositional Commentary) (Kindle Location 1292). Kindle Edition.